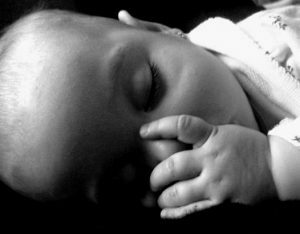 Up to 70% of children under age five have sleep problems. Sleep issues are complicated and have many causes. They’re hard to deal with because when children aren’t sleeping, parents aren’t sleeping, and that lack of sleep affects every minute of every day for every person in the family because lack of sleep isn’t just about being tired. Sleep has a role in everything — dawdling, temper tantrums, hyperactivity, growth, health, and even learning to tie his shoes and recite the ABCs. Sleep affects everything. # 1 A consistent bedtime and awaking time. Foods can affect energy level and sleepiness. Carbohydrates can have a calming effect on the body, while foods high in protein or sugar generate alertness, particularly when eaten alone. A few ideas for pre-bed snacks are: whole wheat toast and cheese, bagel and peanut butter, oatmeal with bananas, or yogurt and low-sugar granola. Vitamin deficiencies due to unhealthy foods can affect a child’s sleep. Provide your child with a daily assortment of healthy foods. Many children get in bed but aren’t sure what to do when they get there! It can help to follow a soothing pre-bed routine that creates sleepiness. A good pre-bed ritual is story time. A child who is listening to a parent read a book or tell a tale will tend to lie still and listen. This quiet stillness allows him to become sleepy. Work with these eight ideas and you’ll see improvements in your child’s sleep, and yours too.